In an effort to use up some scraps of pattern paper before the new papers I have ordered arrive, I pieced together some Basic Grey Out of Print scraps, and die cut some Cheery Lynn Butterflies, adding them around the Faith, Love, Hope quote from Verses. Thanks for stopping by, I'll see you later tonight for this weeks CR84FN challenge! Beautiful card, love the sentiment, the background papers are beautiful and those butterflies are stunning. Well composed, awesome job. Nice card. Like the butterflies. Fantastic use of scraps! Love the buttterflies and sentiment! You know I did rush out and buy some of those dies and made a card ASAP! Love them! Elegant card. 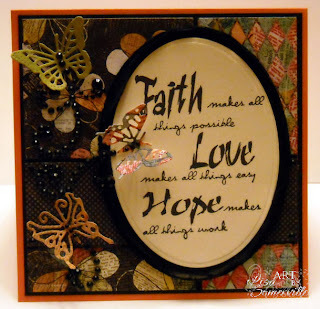 The flourishes, sentiment and butterflies all combined with the design is lovely!